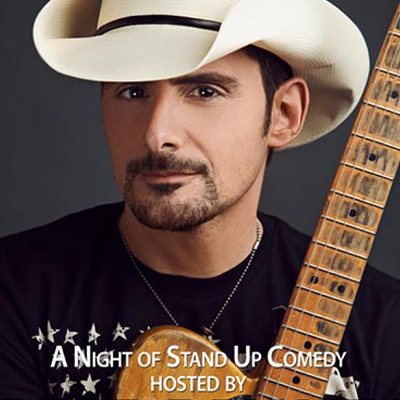 Country music superstar Brad Paisley returns to host a night of stand-up comedy at Zanies Comedy Club on Thursday, April 19 at 6:30 p.m. as part of the 2018 Nashville Comedy Festival. Tickets are on sale Tuesday, March 13 at 10:00 a.m. Go to www.nashville.zanies.com or in-person at Zanies. This will be Paisley’s fourth stint as host to the unique night of surprises and laughter. Last year’s installment was filmed and produced for Netflix, and dubbed Brad Paisley's Comedy Rodeo. The 60-minute special features Paisley and his cast of stand-up comedians, along with cameos by David Hasselhoff and Reba McEntire. The Nashville Comedy Festival will boast a stellar lineup across multiple stages the week of April 16 through 22. The festival’s venue partners include some of the most iconic locations in Nashville, such as theBridgestone Arena, Ryman Auditorium, TPAC's James K. Polk Theater, War Memorial Auditorium, Zanies Nashville, and Exit/In. Brad Paisley is a critically acclaimed singer, songwriter, guitarist and entertainer whose talents have earned him numerous awards, including three GRAMMYs, two American Music Awards, 14 Academy of Country Music Awards and 14 Country Music Association Awards (including Entertainer of the Year), among many others. He has been a proud member of the Grand Ole Opry since 2001. Paisley’s successful 2017 Weekend Warrior World Tour continues through March of 2018 with an additional 30 shows. Paisley has written 21 of his 24 #1 hits. His 11th studio album, LOVE AND WAR, which was released April 21, 2017, was his 9thconsecutive studio album to debut #1 on Billboard’s Top Country Albums chart. On April 28, 2017 LOVE AND WAR was released as country music’s first ever visual album for a limited time exclusively on Apple Music and now is available on VEVO. Paisley has partnered with Boot Barn® and developed an exclusive line of jeans, hats, T-shirts, jewelry, belts and woven shirts called Moonshine Spirit by Brad Paisley. Connect with Brad at www.BradPaisley.com,www.Facebook.com/BradPaisley, on Twitter @BradPaisley, on Instagram @Brad Paisley, and YouTube at YouTube.com/BradPaisley.